To use your lab’s existing thermocycler or liquid handler, choose the prepGEM Universal Kit, optimized to extract DNA from cell culture and solid tissues. Temperature-controlled, hands-free, single tube processing makes prepGEM perfectly suited for preparing DNA from a wide range of solid tissue and insect samples, ensuring the integrity of the sample with no loss of DNA. This kit produces single-stranded DNA suitable for STR, PCR, qPCR, whole genome amplification and the generation of amplicon libraries. 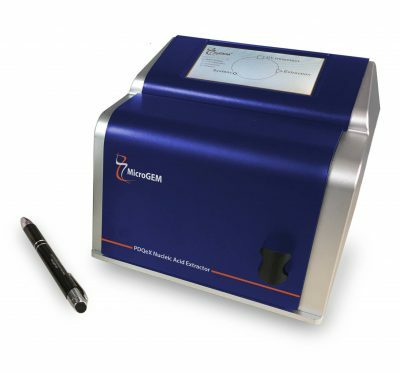 MicroGEM’s automated technology provides hands-off, single tube, temperature-controlled DNA extractions for various types of tissue samples, with added capabilities to generate purified, double-stranded DNA. The purification is achieved within the innovative PDQeX tube. When the extraction is completed, DNA is automatically forced through the purification matrix. This method preserves DNA yields, reduces contamination and significantly speeds up the entire extraction process to under 15 minutes. 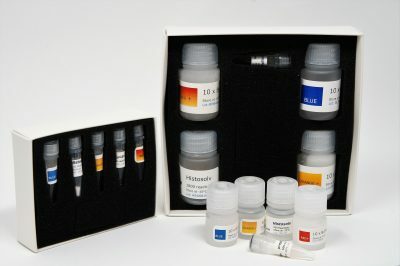 This kit produces DNA suitable for STR, PCR, and qPCR, and is ideal for high throughput screening.